What a week! Where do I begin? Saturday and Sunday my husband and I did a lot of work inside and outside our home. I might have pushed myself a bit too far on Sunday, but I felt so accomplished. Monday I had an appointment with the perinatologist to check the baby’s position and size. He was head down (YAY! ), but unfortunately my fluid was very low. They’re supposed to be able to find and measure four pockets of fluid, but they could only find one, so they were pretty concerned. They told me that I needed to drink lots more water, especially the kind with added electrolytes, and to take it easy and come back Friday (I’m writing this on Thursday, so I’ll go back tomorrow). Basically, when your pregnant, all the water you drink goes to your own muscles first, then what’s left over goes to the baby. So, if I do too much physical activity, the baby won’t be getting the fluid he needs and that could be why my levels are so low. They didn’t give me a straight answer on whether or not I should go back to work – one tech said no, the other said sure, as long as I stayed sitting (which is hard as a teacher). Then, I spoke to my OBGYN who told me I would be going in twice a week for non-stress tests and that I was done working, so that was that. I stopped by work later that day to pick up my computer and some papers to grade that I had recently collected and wrote a good-bye note to my students on the board. Most people think it’s great I don’t have to work and, while it is nice not to have to get up early everyday, it’s actually kind of hard right now. I wasn’t prepared to leave yet, so I’m emailing with my department chair constantly about the transition to the new teachers. Plus, this means I’ll get less money on my next paycheck than we had planned, so that’s an additional stressor. Speaking of stress, my husband just found out today that he has shingles, which is often caused by stress. Lovely! Since I’ve had chicken pox before, I should be safe, but it is definitely terrible timing. Luckily it doesn’t seem like he got a terrible case and it’s already on it’s way out. I hope it clears up soon, because I’m going to need him at his healthiest once we have the baby! On Monday, we came home from the doctor to no internet. They disconnected our service because we’ve actually been getting internet for a really long time without being billed for it. One day they just stopped sending us bills, but the internet kept working, so we’ve been thinking they might catch on one day. Fortunately, they won’t charge us for the months they forgot to bill us, but we won’t have internet until Friday (tomorrow for me, today for you). It hasn’t been ideal that my first week at home I haven’t had internet, but luckily my mom lives close by, so I’ve been able to come over a couple of days to get some things done for work and to blog. 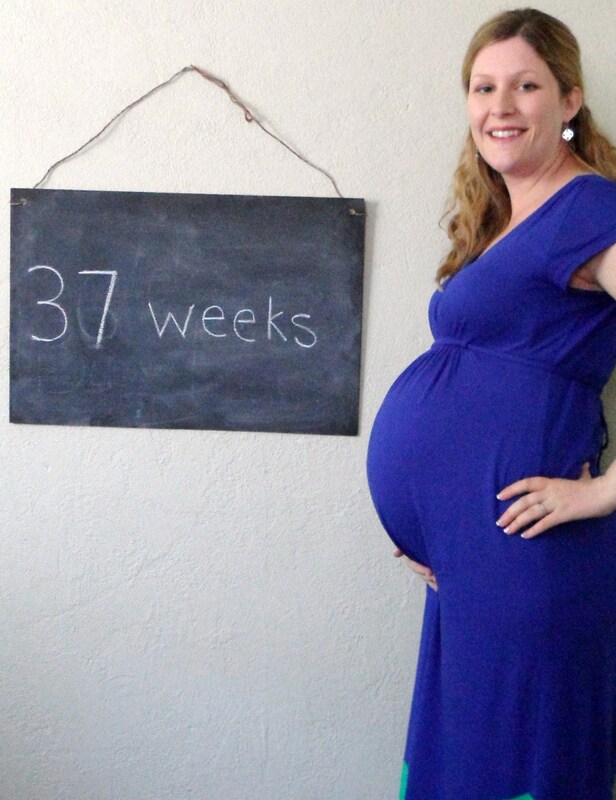 37 weeks is officially full term, so if I went into labor, I’d have a baby! We are thinking with the low fluid levels that I’ll probably deliver sooner rather than later, either by going into labor on my own, or being forced to by my doctor (induction or c-section) if the baby needs to come out. My husband wants a St. Patrick’s Day baby, but I hope he stays safe in there for another week or so, at least. However, by this time next week, I might be so bored and over it, I could be begging for him to come out! The nursery is FINISHED!! I never thought I’d see the day. Michelle is taking pictures on Saturday, then I’ll be able to share Liam’s room! I can’t wait for you guys to see it. I think it looks pretty cute. The only thing left to do before the baby comes is to finish grading those papers (once I have the baby, who knows when I’ll be able to work on them) and clean clean clean. I’m really hoping we can hire someone to come next week to clean, though, because 1) I don’t want to do it 2) my husband can clean, but not as well as I’d like and 3) I probably shouldn’t be doing the type of physical activity it will require. Other than that, we are ready to go! Well, as ready as we can be, I suppose. So so so excited!!!!! Sorry you have to stay home from work, but use this as time to rest and gather strength for your upcoming delivery! 🙂 Praying for you as always! Hi Amy, I’ve been reading your blog since before you got pregnant and love the way you write. I am now 11 weeks pregnant and loving it! You look so beautiful with your big belly! I can’t wait to look like that! Hope you have a beautiful and healthy baby! Thank you for reading!! Congratulations and best of luck to you! Yay! I can’t believe Liam will be here SO so SO soon. It’s crazy! Aw, yay! 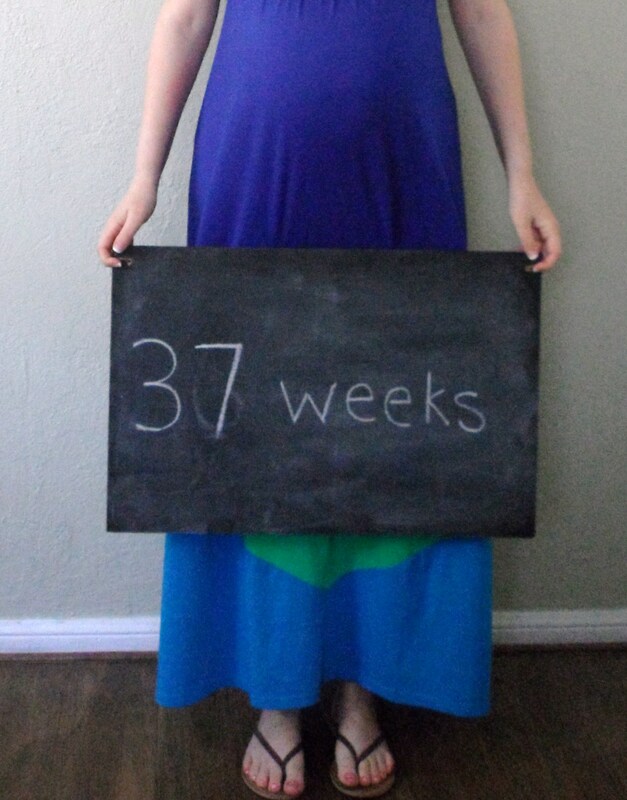 We should get a pic of the two of us in our matching dresses before I pop!! Ugh, sounds like you and your husband are having a rough and unexpected kind of week! Sorry you’ve had so much to deal with!